The “battle zone environment” of the downtown Los Angeles Superior Court is something to witness in person if you have never been there to experience it. It is not for the faint of heart. The downtown Los Angeles Superior Court, located in the Stanley Mosk Courthouse, at 111 North Hill Street, is one of the largest in the United States. It is an old building that needs to be razed, modernized, and rebuilt as a state of the art courthouse, but it is what it is. The Court has more than 75 judges on 10 floors that handle, civil limited and unlimited jurisdiction cases, unlawful detainers, small claims cases, writs and receivers cases, family law cases, probate matters, post- judgment matters, and other hybrid matters. The clerk’s office is overburdened, and attorneys must wait in the same long lines as messengers to file a document. At times the clerk’s office is understaffed and only 2 clerks are working when the line is 25 persons deep. Criminal cases are handled in another location around the corner in the Criminal Courts building on 210 West Temple Street. The court system is overburdened with cases in most departments, and some judges have in excess of 12 distinct case matters on the calendar each and every morning. You may or may not get a perfect evaluation of your case matter on calendar, or a just and fair result from the Court. Generally speaking, I will say that the Courts and their staff usually get it right– sometimes they don’t and one side gets a raw deal. That is when an appeal may be required. Probably the most important safeguard a party can have is retaining counsel that is really watching the case and your opponent and monitoring Court staff carefully. 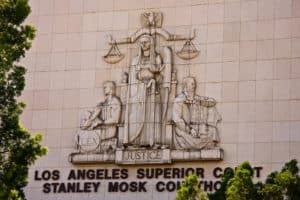 If you ever visit a courtroom at the Los Angeles Superior Court you will be amazed at the number of attorneys that are present, and you will be amazed at how long matters take get decided and completed. Due to the large calendars, it is generally the norm that a 5 minute contested court matter can take 1.5 to 2 hours to be heard and decided. Bring a newspaper and a pillow cushion. Judges are overburdened and very busy, and often have approximately 12 case calendars 4 to 5 days per week in the morning- that is an enormous case load. Attorneys also use “court call” to make appearances by calling in on routine matters such as case management hearings and post mediation status conferences. Court call service has made it easier on attorneys to avoid a personal appearance on routine matters. Still, the phone call hold times can be as much as one hour in busy courtrooms. Small claims and unlawful detainer calendars are huge, and judges are on a tight time schedule to complete these calendars. JUDGES ARE LESS ACCOUNTABLE BECAUSE NO COURT REPORTERS ARE PRESENT UNLESS YOU RETAIN ONE. It is unfortunate that judges may be less accountable and scrutinized for their decisions, behavior, and demeanor, as they used to be. That is because in courtrooms, the courthouse administrative staff does not provide free court reporters to take write down a transcript of what happens and what is said in court. The days of the free court reporter are over! Court reporters are only available if parties pay for the court reporters. The end result is that some judges may be less thorough on the record since there is no court reporter taking down the judge’s statements. So if a judge abuses an attorney or berates a witness or bad mouths a party or makes a poor, unsupported legal decision, the verbatim language spoken by the judge is not recorded unless a court reporter is hired to be present. If a judge makes a mistake on ruling on the admissibility of evidence, an oral ruling is not recorded unless a court reporter is hired by the parties to be present. Court reporters are expensive and charge by the word. Having a court reported record is very important for a case on appeal. The appellate attorneys and the Court of appeal can review the record, and determine if the Court has made an error. Judges make “minute orders” about their proceedings and their rulings. They write down their decision, note the appearances, but the minute order does not report the verbatim words of the judge, only the final ruling. During lunch time the cafeteria on the 10th floor is packed with attorneys and parties who share a common theme – their cases have not settled and they are waiting for their trial to start or a trial to continue. The cafeteria and its 100 tables act as a makeshift non-private conference room for attorneys and parties who are discussing cases, documents, and strategies. Some judges may order the attorneys and the parties to gravitate to the cafeteria to try to work out a settlement or to try to resolve a discovery dispute. Cafeterians also have to tolerate the cafeteria food at the courthouse, which on some days is at most average, and on other days is lousy. If you don’t like the cafeteria there is a Starbucks café next door with limited indoor seating taken up by at least one local derelict. Due to budgetary cuts, court clerks only have limited phone hours, such as 10:00 a.m. to 12:00 p.m. only. If you don’t make the call at the right time, you have to wait until the next day to speak to a clerk and get your question answered. Courtrooms are closed from 12:00 p.m. to 1:30 p.m. Judges may be able to get 9 golf holes in or take a cycle ride before the afternoon trial calendar begins. In the afternoon, judges generally hear trials and a discovery dispute or two- the trials may be bench trials or jury trials. For jury trials, judges have to deal with the attitudes, behavior, and schedules of jurors. Jury selection and the process that goes along with it are very “political” in nature. Attorneys are obviously trying to manipulate the jury system to get favorable jurors from the jury pool. Judges spend energy and resources protecting and buffering jurors from the aggressive attorneys in the courtroom and trying to keep the jurors relatively happy in the process. Since jurors are registered voters, and voters tend to vote in judicial election, judges try to keep jurors happy and want to get them in and out of the system as rapidly as possible with the least amount of scar tissue. This is difficult, and judges always want to appear that they are moving matters forward, and not letting jurors wait around.